I've been making this cake for a few years now, ever since I got into making my own sourdough. I never got around to blogging it but I thought I better add it to the collection now as it definitely deserves to sit alongside my other favourite recipes. I blog sporadically, I'm not fanatical about posting up new recipes every week or even every few days like some other bloggers but I'll blog when I know something is worth it. I guess this blog serves as my online cookbook, only my tried and true favourite recipes will be logged. Some will be my own creations, family recipes and some I've found elsewhere. I apologise if anyone expects me to be updating regularly, though any readers will be rewarded with quality rather than quantity. 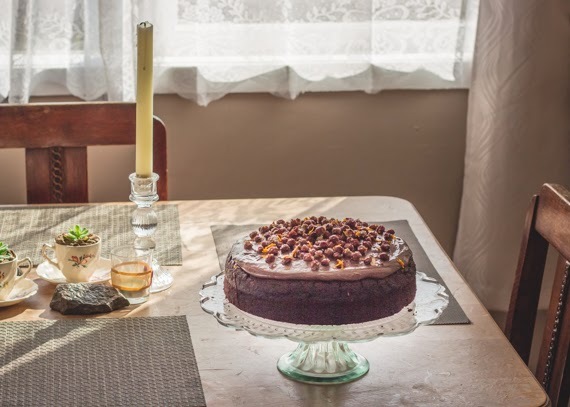 So anyway today's recipe is one that I often turn to when I need an occasion cake, something that I like to give to others (or myself when I get the craving!). Chocolate cake tends to be universally loved so is a good go-to, though to be honest I'm usually not that much of a chocolate cake fan. I find they're often dry or insipid. Not this cake though, it has a nice depth of flavour and moistness without being too rich or sickly. Basically, I love it. And that says a lot from someone who is otherwise not a chocolate cake fan. So it's one I enjoy making for myself, and for others, as I think it's a cake that anyone would love. To make it you'll need some sourdough starter. If you make sourdough bread at home you'll know what I mean. If you don't, then you should! If you want to learn more about sourdough then you can check out my sourdough post from a few years ago. It's easy and fun, and using sourdough in your baking will reward you with a unique deliciousness. In a large bowl, mix together the starter, flour and milk. Cover and let rest at room temperature for 2-3 hours. Preheat oven to 180 Celsius, lightly grease or line a 23cm round cake tin. In a separate bowl, beat together the sugar, oil, vanilla, salt, baking soda, cocoa and coffee powder. The mixture will have a grainy texture. Combine the chocolate mixture with the starter mixture until smooth. It will be gloopy at first but will smooth out. Most importantly make sure you mix it well, but gently, so that the starter mixture is fully integrated into the chocolate mixture. Any unmixed starter will become bits of bread in your cake once it's baked! Pour the smooth mixture into your prepared tin. Bake 30-40min or until cooked through. 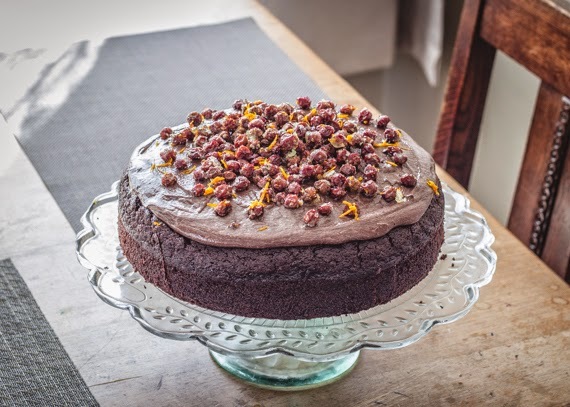 Once the cake was cool I spread on some chocolate frosting and sprinkled it with crystalised cranberries and grated orange rind. It's also nice to use other berries of your choice, such as blueberries or raspberries, but is also ideal to serve it without any toppings at all. Simple but delicious. add cocoa and boiling water and beat until creamy. Lightly beat an egg white, dip the berries into the egg white then roll them in sugar. Spread them out on a baking sheet to dry. Made with chopped apples, raspberries and blueberries. Cooked in a 23cm round cake tin. Made with cranberries and sliced apples, dusted with icing sugar. Cooked in a small loaf tin. I love discovering desserts that are easy and economical to create at home. Finding one that is also quick to whip up is an even bigger bonus. Clafuotis are all of that. 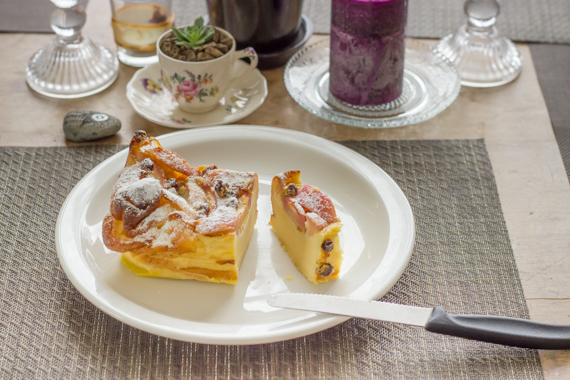 Clafoutis are a French dessert, a delicious baked custard topped with fruits. It's dense enough to be sliced yet is still beautifully soft and light. Traditionally they are topped with cherries but are suited to so many other combinations. 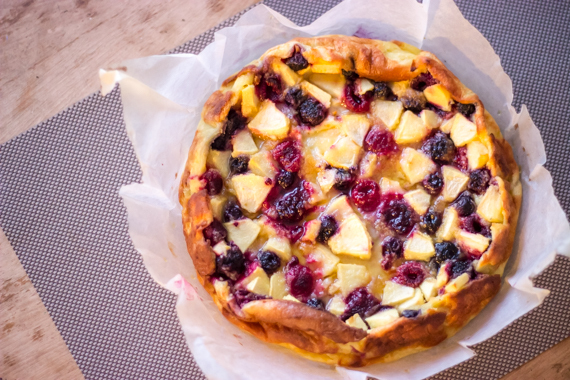 When fruits other than cherries are used then the dessert should be called a Flaugnarde, but it's still common in English speaking countries to still call it a clafoutis. But being technical is getting boring, so let's just call it amazing. Other fruits or berries are great substitutes for cherries. You can also add nuts or dried fruits that have been steeped in alcohol or juice. It's great fun to experiment with what you have in the cupboards or what is seasonal in your area. I definitely recommend giving this recipe a go, once you see how simple and delicious it is it might become one you your favourite's too. Butter, or line, a baking dish or a few small ramekins. I often like to use a silicon loaf tin as I like how it makes nice slices for serving. Anything is fine though as long as it has the capacity to contain approx 3 cups of batter. Blend or whisk all of the ingredients (except the fruits/berries/nuts) until the batter is smooth. Pour into your prepared baking dish/es. Place the fruits (and nuts if using) on top. Bake approx 30 minutes or until middle is set, I just prod it with a finger to check. It will puff up during baking but will drop again on cooling. Let cool for a little bit and serve lukewarm, dust with icing sugar before serving. It's summertime in New Zealand and Christmas is just around the corner. So like most years I've headed back to my hometown to spend this time with my parents. And a visit with them would not be complete without stealing one of their recipes. Not only is my mum an awesome cook, but my dad is a pretty keen baker too. Though I think it's more because he's a pretty keen eater! So today's recipe is actually one from my dad's repertoire. 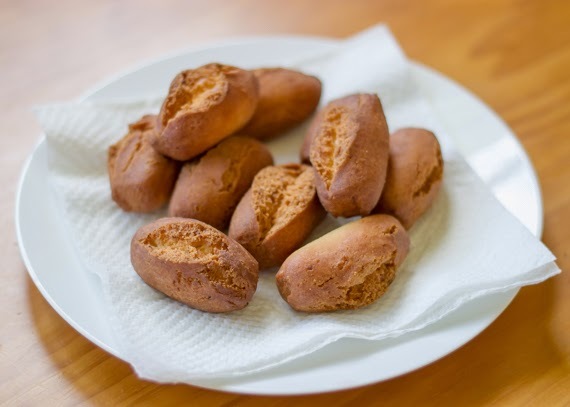 Schenkeli are a traditional Swiss treat. I'm not sure how I should describe them as calling them a cookie feels wrong as they are soft and cake-like in the middle, but not doughy like a doughnut. I guess they have the taste and texture of a deep-fried cake. 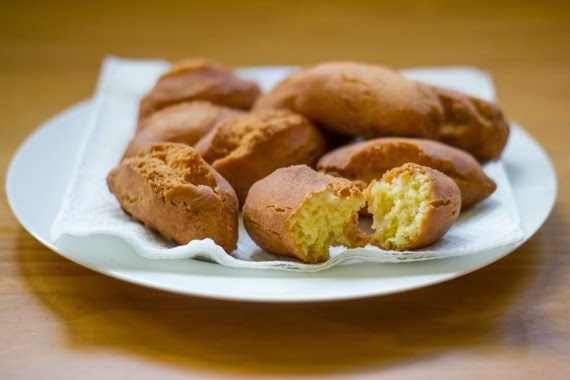 With their hint of lemon they are very reminiscent of a lemon cake...just deep fried. They look pretty unassuming but be warned they are completely moreish. Traditionally they would not be made at Christmas, they are made for other festivals. However, having come from Switzerland to NZ, traditions are bound to be merged or altered. It's all good. 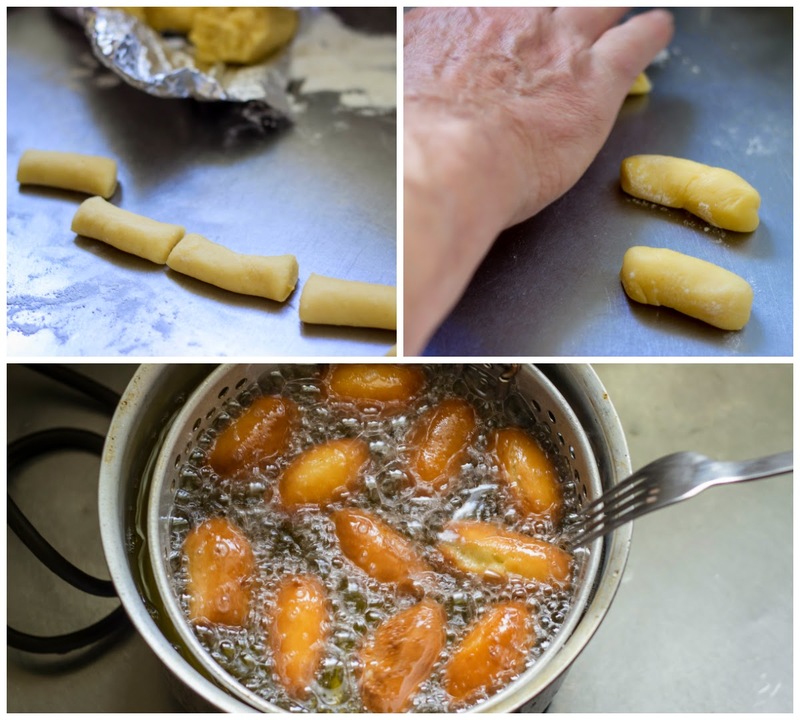 My dad was kind enough to translate his recipe and let me document how he makes them. So here it is. Oh by the way Schenkeli translates to 'Little Thighs' (Swiss baking often has weird names, these being another weird one). Add sugar, salt and eggs alternately and beat thoroughly. Mix flour with the baking powder and then add to mixture along with kirsch and cream. Mix and add more flour if needed. The dough should be relatively firm. Wrap in foil and refrigerate for about 1-2 hours. Divide the dough into portions, shape them into rolls with a diameter of 2 cm and cut them into pieces about 5 cm long. Roll the ends. Deep fry in vegetable oil at 170 Celsius. Temperature control is important; if the oil is too hot, the inside will not be cooked; if the oil is too cool, a lot of oil will soak into the dough. So just test it out with your first batch. We find 7 minutes is ideal, but this will vary so just use your discretion. Just make sure to fry until golden brown and cooked through. Drain on paper towels. Hi I'm Linda, also known as Linno. I was born and raised in New Zealand, however, my family is Swiss and my husband is Indian; so my cooking influences are rather eclectic. I created this blog in order to share my adventures in the kitchen, and to keep a log of all my favourite recipes.